If you’re like most voters – and even more nonvoters – your feeling this morning may be one of relief, as one of the most divisive midterm elections in a generation is finally over and the wave, blue in some places and red in others, has washed over and the nation is still standing. The U.S. House of Representatives will get a Democratic majority for the first time in eight years, but the U.S. Senate will get a few more Republicans. 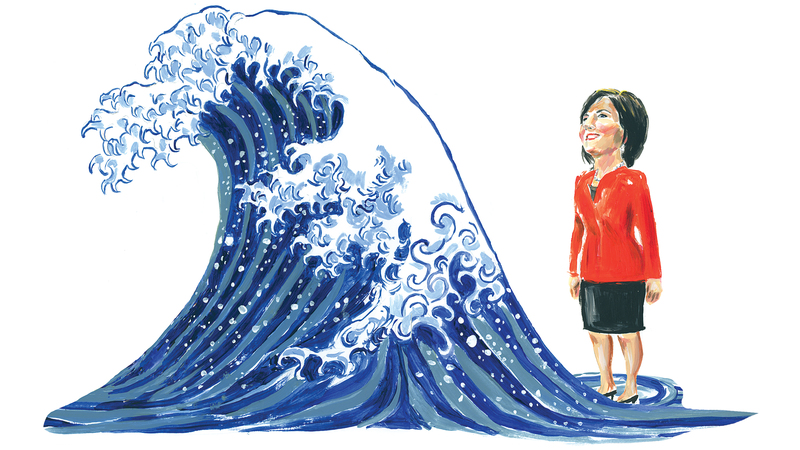 The blue wave skipped Eastern Washington, but seems to have washed over one open congressional seat in Western Washington that is likely to be captured by a Democrat for the first time since it was created 28 years ago. A Republican incumbent in the Vancouver area is in a tight race. Perhaps the Cascade Curtain served as a political dike. Voters have been subjected to robocalls and endless television commercials. Talking heads have dissected polls, usually with a disclaimer that the polls were wrong in 2016. But that didn’t keep them from talking about the 2018 polls every day for two months. For much of the year, Democrats talked about a blue wave that would sweep them into majorities in the U.S. House of Representatives, and maybe even the U.S. Senate, and take governors’ mansions away from Republicans. Their message: We’ll protect your health care, Medicare and Social Security. Despite a strong economy, a galloping Wall Street and plummeting unemployment, Republicans seemed to founder until the fall, when President Donald Trump’s nominee for the U.S. Supreme Court, Brett Kavanaugh, faced an allegation of a teenage sexual assault at the very end of his confirmation proceedings. After a fiery rebuke of Democrats that invoked a conspiracy by the Clintons, Kavanaugh survived the hearings and was narrowly confirmed. That seemed to mobilize both the Republicans and the #MeToo movement. On the campaign trail, Trump hammered on illegal immigration, pointing to an exodus from strife-torn Central American countries heading north in hopes of asylum in the United States as an imminent danger to the country. Then packages of bombs began showing up at offices belonging to Democrats who had been in the crosshairs of the president’s rhetoric. And a gunman killed 11 while shooting up a Pittsburgh synagogue. How much any or all of those tragedies should be tied to the political rhetoric and the upcoming elections became part of the debate, and talking heads argued over who it helped and who it hurt. And behind it all was the talk of the wave. A blue tsunami for the Democrats? A barrel wave like the surfers ride? A hardly noticeable ripple? A few Republican candidates, including U.S. Senate hopeful Susan Hutchison, even talked of a red wave, where the GOP would sweep her and others into Congress. Hutchison was wrong about her own race against Democrat Maria Cantwell, who easily and convincingly won a fourth term in the Senate. But other Republicans did take Senate seats held by Democrats and for the first midterm in modern history, the president’s party lost seats in the House, but gained seats in the Senate. The margin of blue in the U.S. House was unknown as Tuesday flowed into today, in part because of close races in Washington, where hundreds of thousands of mail-in ballots have yet to arrive in county elections offices to be processed and tabulated. In Southwestern Washington’s 3rd District, Rep. Jamie Herrera Beutler is 10,000 votes ahead of Democratic challenger Carolyn Long with tens of thousands more ballots to count. Long is winning Vancouver and Clark County, while Herrera Beutler is winning the surrounding rural counties. Farther north, Kim Schrier, a pediatrician, is about 12,000 votes ahead of former Republican legislator Dino Rossi for another district that stretches across urban, suburban, exurban and rural areas. Schrier is winning King County while Rossi, who has previously run for governor and U.S. senator, is leading in Pierce, Chelan and Kittitas counties. The Washington Legislature got bluer, too, but the exact shade there will also wait for the late counts. Democrats currently hold a one-seat majority in the state Senate, where one of their number votes with Republicans, and a two-seat majority in the state House. They are ahead in two Senate seats currently held by Republicans and less than 300 votes behind in a third. They are likely to pick up at least two seats in the House, with a half dozen other seats too close to call. Turnout could turn out to be one of the true bright spots of the election. After years that saw significant drop-offs after presidential elections, 2018 may have record numbers of ballots cast for a midterm in many states. In Washington, the numbers could come close to the state’s highwater mark of 2016. So if, months of anxiety, anger and antagonism are good for something, it may be to banish voter apathy. Voters can let the wave pass over them, regardless of the color, keep their heads above water and take a deep breath. They should enjoy it while they can, because the 2020 presidential race starts today. Published: Nov. 6, 2018, 11:34 p.m.